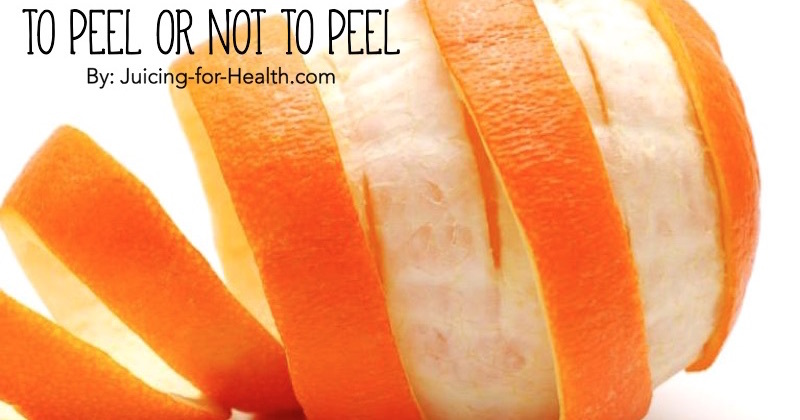 For Juicing: To Peel Or Not To Peel? If you’re new to juicing, this might be one of your most nagging questions—to peel or not to peel? When you invest your time and effort into juicing, you want to get the most out of your produce, squeezing out every last drop. Let’s look at which fruits/vegetables can, and SHOULD, be juiced with their peels left on, and which fruits and veggies should lose their skin before the juicing begins. I don’t think I need to tell you to always eat organic. First of all, if the fruit or vegetable you’re adding to a juice isn’t organic, always peel it. The Environmental Working Group releases a “Dirty Dozen” list every year that outlines the produce with the highest pesticide use. Once you’ve gotten your kitchen full of organic fruits and veggies, before you start preparing your produce, take a look at this list to see which ones to peel before juicing and which ones to leave the peels on. Note: This list is preparation only for if you’re juicing. It may be different if for blending, unless otherwise specified. 1. Don’t remove skin but definitely remove seeds. As with most fruits, the nutrients are most concentrated just beneath the skin, so we try to include the skin in juicing whenever possible. For preparation of these produce, they should be organic if possible. Just wash them clean, cut them up and remove the seeds. With guava, honeymelon and pumpkin (or other squash), you can cut them into slices then scoop out the seeds using a spoon. 2. Don’t peel. Juice with skin and seeds (if any). These fruits and vegetables if organic, have edible skin and just need to be washed and can be juiced as they are, skin, seeds and all. Lemon and lime are best to be juiced with their skin for their bioflavonoids that superboost any nutrients in juices. Watermelon rind and skin when included in juicing, provides chlorophyll and improves juice yield. The seeds will be crushed and included into your juice but they’re rich with zinc and magnesium. If you don’t like watermelon seeds in your juice, you can use a strainer to filter after juicing. As for beetroot, carrot, ginger root, lotusroot potato, rutabaga, sweet potato and turmeric, just wash them using a vegetable brush under running water, and cut out any stubborn dirt, or bruises. See more healing fruits and healing vegetables. 1. Remove skin and remove seeds. This list of fruits have seeds that need to be removed before consumption. Except for cantaloupe (or muskmelon), the other fruits on this list are usually used in blending to make smoothies. Remove the skin, cut them up and remove the seeds before using them in your smoothies. I don’t recommend including cantaloupe skin as it may alter the taste of your juice, and its rough skin may be home for bacteria and pesticides. Mango skin may cause an allergic reaction in some people. While it has vitamins and nutrients, they also contain a phytochemical called urushiol that may cause an itchy rash. 2. Remove skin but don’t need to remove edible seeds (if any). This list of fruits and vegetable (celeriac) definitely need their skin removed before juicing. Dragonfruit, kiwifruit and passionfruit seeds may be added in your juice/smoothie. They are rich in calcium and adds a nice crunchiness to your drink. Unlike lemon and lime, the skins of grapefruit and orange need to be removed as they can taste really bitter and may cause stomach upset when eaten. Some juicing enthusiasts say that kiwifruit skin can be added in juicing and smoothies, but it is really up to you. I usually peel it as I prefer not to have the fine hair on the skin to be included in my drinks, as they may irritate the throat. Pineapple skin has to be removed as this fruit is grown very close to the ground. The rough thorny skin may hide soil, dirt and bacteria that are difficult to wash off. Once you remove the skin, there are black eyelets that are the thorns. Again, this is personal preference whether you want to cut them away, it’s just extra work. For juicing, I usually just leave them. Pomegranate’s hard skin needs to be removed. The arils (the little seed casings) inside may be put through your slow juicer to be juiced. Celeriac is celery root. I suggest to remove the skin as the rough skin surface may hide soil and dirt that are difficult to wash off. I love your page. Very informative. Thank you. The ads sometimes block the recipes but it’s a nice touch that I had the ability to remove them. Thank you for breaking this all down: what to peel, what not, what to seed, what not. Valuable information! Love this. Would be nice to have a Print friendly option version so I could easily print and put near my juicer for the family. Thanks so much for this!